Abbott, Charles. A Treatise of law Relative to Merchant Ships & Seamen. Newburyport: E. Little & Co. , 1810. Allen, Edward L. Pilot Lore; From Sail to Steam. New York; 1922. American Bureau of Shipping; 75 Anniversary, 1862-1937. New York; A.B.S., 1937. American Shipmaster’s Daily Assistant. Portland: 1807. Bakes, Albert S. Morning Stars & Missionary Packet. Honolulu: 1945. Bishop, John A. Suggestions to Masters of Vessels in Case of Disaster. [h.p. 1903]. Blunt, Joseph. Merchant’s & Shipmaster’s Assistant. N.Y.: E & G.W. Blunt, 1822. (Various editions). Buglass, Leslie J. Marine Insurance & General Average in the U.S. Cambridge, Md: Cornell Maritime Press, 1973. Burney, William Dr. Falconer’s Marine Dictionary. London: 1815. Butts, Isaac Ridler. The Businessman’s Assistant. Boston: I.R. Butts, 1847. Butts, Isaac Ridler. The Merchant Shipmaster’s & Mates Manual…Boston: I.R. Butts, 1858. Butts, Isaac Ridler. The Merchant’s & Mechanic’s Assistant. Boston: I.R> Butts, 1858. Clark, Francis G. American Shpmaster’s Guide & Commercial Assistant. Boston: Allen & Co., 1838. Clark, William Bell ed. Naval Documents of the American Revolution. Washington: U.S. Government Printing Office, 1964. Clauder, Anna Cornelia. American Commerce As Affected By the Wars of the French Revolution & Napoleon, 1793-1812. Clilfton, N.J.: A.M. Kelly, 1972. Coggeshall, George. History of the American Privateers & Letters-of-Marque...New York; 1856. Cranwell, John Phillips. Men of Marque… New York: W.W. Norton & Co., 1940. Custom House Souvenir of the Port of New York. 1893-94. Dana, Richard Henry. The Seamen’s Friend. 3d ed. Boston, Little & Brown, 1844.
de Kerchove, Rene. International Maritime Dictionary. 2d. ed. New York: Van Nostrand Teinhold Co., 1983. Dixon, Francis B. The Law of Shipping. New York: H. Spear, 1859. Dixon, Francis B. Handbook of Marine Insurance & Average. New York: H. Spear. 1862. Dudley, William S. Ed. The Naval War of 1812, A Documentary History. Vol. 1. Washington, D. C.; Naval Historical Center, 1985. Dye, Ira. “Seafarers of 1812 – A Profile.” Prologue: Spring, 1973. Dye, Ira. “The Philadephia Seamen’s Protection Certificate Applications.” Prologue: Spring, 1986. Forbes, Allan. Yankee Ship Sailing Cards. 3 vols. Boston, Ma: State Street Trust Co., 1948-1952. Garitee, Jerome R. The Republic’s Private Navy. Mystic, Ct.: Mystic Seaport Musuem, 1977. A History of the Marine Society at Salem. Salem, Massachusetts: The Marine Society at Salem, 1966. Homan, Isaac Smith. A Cyclopedia of Commerce & Commercial Navigation. N.Y.: Harper & Bros., 1858. Huebner, Salomon Stephen. Marine Insurance. New York: D. Appleton & Co., 1920. La Boyteaux, William Harvell. Handbook For Masters. New York: 1919. McCulloch, J. A Dictionary, Practical, Theoretical, & Historical, of Commerce & Navigation. 2 vols. Philadelphia: Carey & Hart, 1847. Miller, William J. Encyclopedia of International Commerce. Centervill, Md. : Cornell Maritime Press, 1985. Montefiore, Joshua. A Commercial Dictionary. 3 vols. Philadelphia; James Humphreys, 1804. Montefiore, Joshua. The American Trader’s Compendium. Philadelphia: S.R. Fisher, 1811. Morgan, William James. “American Privateering in America’s War For Independence, 1775-1783”. American Neptune. April, 1976. Naval Documents Related to the U.S. Wars With the Barbary Powers. 4 vols. U. S. Government Printing Office, 1939. Niles Weekly Register. Baltimore, 1811-1849. Parsons, Theophilus. A Treatise On Maritime Law. 2 vols. Boston: Little, Brown & Co., 1859. Prince, Carl E. The U.S. Customs Service: A Bicentennial History. Washington D.C.: Dept. of the Treasury, 1989. Register of Approved Shipmasters. N.Y.: 1865. Rubin, Israel Ira. New York State & The Long Embargo.. Dissertation, N.Y. University, 1962. Serene, Frank H. “American Immigrant Genealogy: Ship Passenger Lists” . Prologue: Summer, 1985. Sullivan, Eric. The Marine Encyclopedic Dictionary. Valetta, Malta: Gulf Publishing Co., 1980. U.S. Congress, The New American State Papers: Commerce & Navigation, 1789-1860.47 vols. Wilmington, Delaware, Scholarly Resources, 1973. The U.S. Consular System: A Manual for Consuls.. Washington: Taylor & Maury, 1856 ed. U.S. Nautical Magazine & Naval Journal. 7 vols. N.Y., O.W. Griffiths, Monthly, Oct. 1854-Mar. 1858. Warren, June S. The Morning Star: A History of the Children’s Missionary Vessel…. Boston: American Tract Soc., 1860. Wynkoop, Richard. Vessels & Voyages New York: D. Van Nostrand, 1887. 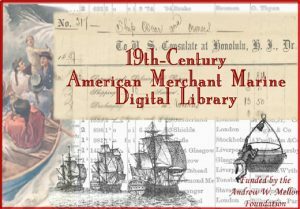 Selected bibliography from American Maritime Documents, 1776-1860, Stein, Douglas L.